PRESIDENT BUSH AND LAURA BUSH GREET STAFF AND GUESTS ON THE SOUTH LAWN PRIOR TO DEPARTING FOR CAMP DAVID. THE PRESIDENT SHAKES HANDS WITH A BOY WEARING AN ORANGE "TEXAS ATHLETIC DEPARTMENT" T-SHIRT. THE BOY GIVES THE "HOOK 'EM HORNS" GESTURE. 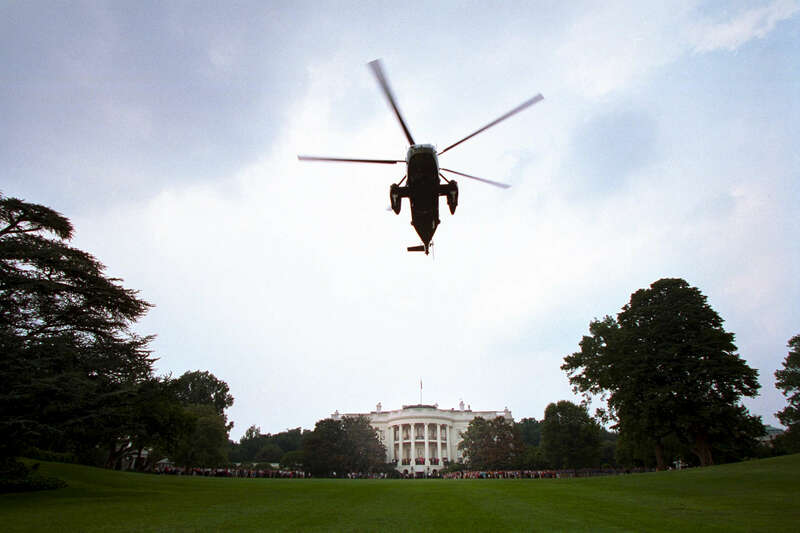 SHOWS MARINE ONE DEPARTING THE SOUTH LAWN, THE WHITE HOUSE IS IN THE BACKGROUND (JUMBO P4791-16).